Dr. Joseph Bressler is a research scientist at Kennedy Krieger Institute. He is also an associate professor of environmental health sciences at the Bloomberg School of Public Health at Johns Hopkins University. His research focuses on delineating responses to environmental agents that modify DNA methylation in the brain, with specific focus on the glial lineage. 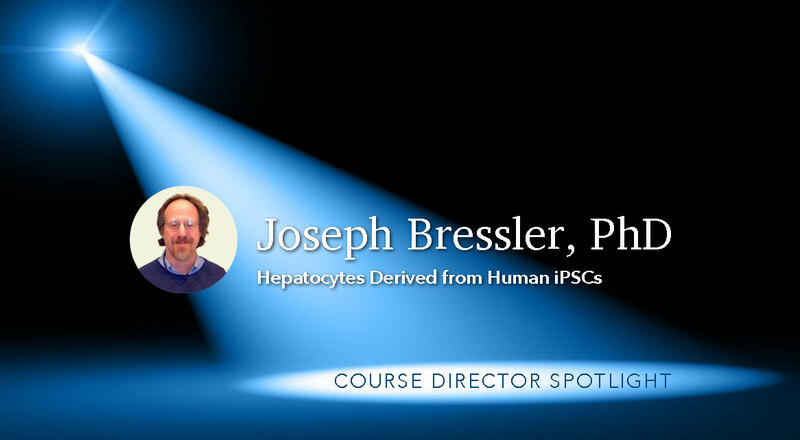 Dr Bressler is the Course Director for the upcoming Hepatocytes Derived from Human iPSCs workshop offered by Bio-Trac. This four-day hands-on workshop offers advanced training for research scientists and is ideal for researchers interested in developing hepatocytes from iPSCs. Dr. Bressler is the Director of the Advances in Epigenetics Workshop as well. Tell us a little about yourself and how long you have been working with this technology? "I received my doctoral degree in physiology from Rutgers University in 1978, and did my post-doctoral training at UCLA in neurosciences, where I studied the involvement of glial cells in response to toxic agents. I continued my research on glial cells at NIH in Bethesda, Maryland before joining the Kennedy Krieger Institute in 1988. I have been working with stem cells in my research for about twelve years." What type of research is your lab is focused on? "Our laboratory studies how environmental pollutants affect neurodevelopment with specific interests in autism and fetal alcohol syndrome. Specifically we are studying transporters and their interaction with environmental toxins; neural differentiation, now transdifferentiation." What excites you about your research and the advancements happening in the stem cell research field? "As researchers in the stem cell field, I see us as the new world explorers and I am excited by the challenge of making new discoveries. Designing and conducting experiments is not too different from art, creativity and working with your hands. We too are creating something that is brand new to this world and sharing our discoveries with others." What types of research does hepatocytes from iPSCs have the most application for? "Hepatocytes derived from human iPSCs have use in drug discovery, toxicology and possibly in transplantation. Hepatocyte cultures are used in pharmacology and regulatory toxicology to provide information on drug metabolism and toxicity. Hepatocyte cultures derived from IPSc (HC-iPSc) express many of the properties displayed in human liver. HC-iPSc are renewable and could be generated from different genetic backgrounds. Consequently, HC-iPSc have great utility in pharmacology and regulatory toxicology." Why should a researcher attend this workshop? "This workshop is a great opportunity to learn about new advances in the field, and the techniques necessary to make apply these advances to your research." Why (what) do you enjoy most about leading these workshops? "I enjoy being able to influence the world of stem cell research by helping other investigators to do good science." What differentiates Bio-Trac from other training programs? "One of the major differentiating factors you see with Bio-Trac programs is that they uphold a certain standard in their workshops that is set by recruiting faculty who are not only experts in their field, but who truly care."